My passion for the natural world has driven me to create these images. The 'glyphs' are designed to capture the essence of the animals they represent in a simple, elegant, and powerful manner. I experimented with all manner of materials — bone, wood, metal — but nothing felt quite right. I wanted something natural, durable and beautiful yet not damaging to the environment. When I discovered tagua - it was love at first sight. Tagua 'the nut of a rainforest palm tree' - is a naturally renewable resource with many qualities similar to animal ivory. Wear it, display it, or simply keep it nearby and always have your guardian close to your heart. These talismans are a physical reminder of the spiritual essences which inspire and surround us. Lovingly hand-crafted one-by-one, each pendant is a unique work of art. 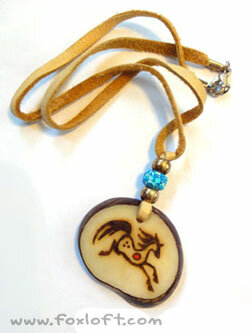 Is there a custom tagua pendant you would like made? Email us your inquiry! Ancient wisdom, primal energy, survival, tradition. Alligator people tend to be assertive and self-assured, but are subtle and not overly showy. They are confident in their own power and not afraid to use it, but are rarely aggressive without good reason. An alligator totem can teach us to be patient, observant, and how to excel in life using our natural talents. Aurochs are the ancestor of modern day domestic cattle. These massive bovines stood well over six feet at the shoulder and were much larger than the cows we know today. Aurochs as a totem can teach us to go back to our roots, explore our family and personal history, and simplify our lives to the core. Also, see the totemic information regarding Bull. Powerful, passionate, aggressive. Badger people are often very self-confident and self-reliant, fiercely loyal to those close to them and rather off-standish to those that are not. Badger medicine teaches people how to be introspective, withdraw into themselves, and create a strong, defensive exterior. Luck, happiness, transformation. Bat medicine is often hand in hand with the need for personal transformation; whether that is a need to break old habits or ties or form new ones. The bat is a guide, helping people to understand difficult situations and giving them strength to make necessary changes. The bear is an extremely strong symbol of healing and personal strength. Bear medicine is often tied to introspective healing; the need to go within oneself to find answers. The bear is also a symbol of direction and of being able to know when you are on the path that is truly right for you. Fun, Joy, Curiosity. Beluga as a totem teaches us to be playful, empathetic, thoughtful, and sociable. It highlights the importance of relationships, communication, touch, and sharing. Beluga people tend to be gentle, imaginative, creative, musically inclined souls. They heal through the power of words, music, voice, or song. Beluga people tend to trusting to a point of vulnerability, sometimes shy or easily frightened. Beluga medicine teaches us to keep a light attitude, to not take things too seriously; keep a positive attitude in dark or difficult situations, always looking for the light. Beluga symbolism is full of the wisdom of humor; the carefree, clever prankster, attentive sensitivity, and genuine caring. Flexibility, relaxation, zen. Binturong as a totem teaches you to take things at your own pace, the ability to handle multiple tasks without being stressed or rushed. Though often relatively unknown and underestimated, binturong people are very talented, agile, and confident in their personal element. Binturong medicine teaches us to be happy with what we are given and to find the positive aspects in any situation. Solitude, Clear vision, Secrets. Bobcat as a totem teaches us to be open and observant, to listen and be receptive to our own perception and that of others. It highlights the value of trust and keeping confidences. Bobcat medicine develops the ability to be nurturing, accepting, and curious about ourselves, flexible and involved in our own development and in control of our relation to the world. Bobcat people tend to be mysterious, enigmatic, outgoing, elusive, quirky and energetic. They know how to live life to the fullest – whether it is work, play, or relaxation. Fertility, masculinity, strength. With a fiery temperment and no lack of brute strength, the bull is a very strong symbol of masculine power. It is often associated with the sun, but also with the moon and the skies. It is also a symbol of justice and order. Freedom, creativity, beauty. Transformation of mind, body, or soul and a light-hearted, joyful attitude. Living for the moment, in harmony with yourself and your path in life. Butterfly medicine often brings major changes in a short period of time, often large bursts of dramatic energy. Patience, perseverance, stamina. Camel people are often superbly adapted to their own situation, but rather clumsy and inflexible in others. The camel is a symbol of a strong work ethic and stubborn attitude. While camel people can often be short tempered with small annoyances, they have almost limitless patience for life's most difficult hurdles. Caribou is one of the strongest symbols of a personal, spiritual journey. The caribou spirit is a guide, carrying and leading people to the spirit world and back. Caribou people are often very sensitive to the energy around them and spend their lives walking between two worlds. Part human, part horse, the centaur is a harmonious merging of dual aspects. Centaur people are often philosophical and intellectual but at the same time capricious and full of good humor. They are often a seemingly unpredictable study in extremes. Chipmunk people are often spunky, energetic, and trusting. They are often inquisitive and independent, having their own agendas and are not likely to tolerate being told what to do. Chipmunk medicine is deeply rooted in observation and detail. Personal power, assertiveness, agility. Cougar teaches us to be capable leaders (though often in an unconventional fashion) – guiding others through example, expertise, experience, and a judicious use of well-earned influence. Mountain lion people tend to be confident, moving through their lives with purpose and skill. Puma medicine teaches us balance in our lives, leaping sure-footedly from challenge to challenge, meeting all difficulties in life with poise and grace. Coyote is a complex symbol of humor, cunning, and survival. Coyote is often portrayed as the 'wise fool', helping people to see the truth in difficult situations. Coyote medicine is often strongly tied to learning to be adaptable, seeing the humor in even the worst situations, and being able to cope with even the toughest things life can throw at you. Intelligence, adaptability, survival skills. Crow people often find a harmonious balance in their lives between cities and wild places, though they often stay tied to city life through want or need. Crow represents change, whether it be through growth or destruction. Crow is the opposite side of the same coin as raven. Compassion, regeneration, sensitivity. Emotionally sensitive, deer people tend to be quiet, gentle, empathic, spiritually well-attuned. Deer medicine teaches people to fully open themselves to the world, physically and emotionally. From this, they gain incredible power and experience, but give themselves a balancing weakness, the chance of being hurt, at the same time. Communication, intelligence, emotion. Dolphin people tend to be sociable, playful, and kind. Dolphin medicine teaches people to be motivated, inquisitive, and full of life. It also teaches people the importance of not taking oneself too seriously. Trust, Simplicity, Innocence. Dove as a totem is a symbol of serenity, calm, and peace with the world. Dove medicine can teach us to be gentle, loving, generous, and accepting people. Dove people tend to be affectionate, flirty, home-oriented, and are natural nurturers. Dove energy can teach us to be more open and allow ourselves to be vulnerable, letting our true selves out from behind barriers and masks we have created as protection from the world. The eastern dragon is a symbol of power, courage, and nobility. They lord over the water, sky, and earth alike, combining these elements into strong celestial powers. As a totem, the dragon is a supreme spirit of luck and good fortune. He is a vigilant, divine protector. No matter where your life may take you, be assured your true path will be shown to you. This benevolent dragon heralds blessings, kindness, and greatness. Dragon people tend to be energetic, decisive, optimistic, intelligent and ambitious. The dragonfly is steeped in illusionary magic – the ability to create a strong, almost ‘hypnotic’ outer shell for the world, to see beneath your own illusions and those of others, and to gain strong mental clarity. It is also a messenger, carrying with it messages from the past, from far distances, and from the spiritual realm. Dragonfly is a representative of what it means to be light, reflective, and full of joy – in all senses of the words. Dragonfly medicine tends to be very emotional, and passionate, often accompanying a great revelation or discovery of self. Freedom, power, clarity. Eagle people tend to be ambitious, passionate, intelligent, and playful though they often have a quick temper. Eagle medicine can teach us how to take risks, making a leap of faith when the time is right. Eagle as a totem helps us to embrace and develop a sense of confidence, clarity, righteous judgment, and balance in our lives. Eagle is a tempestuous teacher, but brings deep wisdom and helps us to aspire to greatness. Falcon medicine teaches us to truly see the world around us, to always be aware, and to find the hidden meanings within both ordinary and complex situations. Falcon people tend to take things to the extremes. The falcon is a symbolic messenger, able to fly between the physical and spirit worlds. Playful, light-hearted, crafty. A small fox, the fennec is similar to its larger cousin, but has a more easygoing nature. Fennec people can be shy, but tend to have a good sense of humor, keen mind, and enjoy being an all-around jokester. Curious, mischievous, high-energy. Ferret people are often playful spirits with a calculating mind. Ferret medicine teaches resourcefulness, self-reliance, and ingenuity. Very similar to the weasel, with a slightly less serious edge. Patience, wisdom, intelligence, adaptability. Fox people can be high strung or exceedingly calm, charismatic or mysterious, prone to stand out or blend in, keep peace or make mischief. They tend to be partially rooted in the spirit world, living day to day in sort of a 'world between'. Foxes are a strong symbol of femininity, shape-shifting, illusion, and magic. Sensitivity, regeneration, renewal. In many cultures, frogs are a strong symbol of luck and wealth. Frog medicine teaches the power of transforming oneself, a natural path of change that occurs over a lifetime. Frog is also a symbol of femininity and fertility, and natural healing. Frog people tend to be pleasant, positive, and well in-tune with the energies around them. Physical awareness, agility, stealth, independence. Passion, sensuality, personal magnetism. Inquisitive but cautious, alert, resourceful. A genet totem can teach us to be more passionate, connected and balanced in our lives; To be efficient and focused at work and playful and relaxed at home. Primal energy, objectivity, focus. Like all of the raptors, hawk is often seen as a messenger, flying between the physical and spirit worlds. Hawk as a totem teaches skill gained through hard work and patience, honing our natural talents into strong abilities. Hawk people tend to be visionaries, with keen eyes; observant and with great attention to detail. Hawk medicine teaches us to soar above ourselves and see our lives from a broader perspective, getting a better view of the big picture. This particular glyph image invokes the idea of hawk as Thunderbird. Defense, simplicity, tenacity. Hedgehog as a totem teaches us independence, the importance of taking care of ourselves, and how to enjoy life. Despite their carefree nature, hedgehog people remain well grounded, practical, and have a solid constitution. Hedgehog medicine teaches us to be curious, confident, meek, and present in life. Hyena people tend to have a good sense of humor and do not take themselves too seriously. The hyena as a totem is a symbol of integration between aspects of male and female. Hyena medicine teaches us balance, realizing our own powers, and being happy with what we are given; not wanting for what we do not have. Energetic, creative, capricious. Kangaroo people are often dreamers and can tend to be impulsive. Born travelers, they rarely stay rooted in the same place for long. The kangaroo is also a strong symbol of endurance. The kitsune is a shapeshifting Japanese fox spirit. 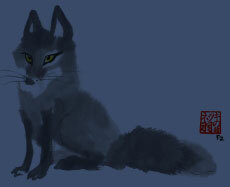 Extremely intelligent, long lived, and magical, the kitsune is often portrayed as a trickster. The number of tails a kitsune bears is said to be relative to its age and wisdom. Kitsune as a totem can teach us cunning, control, patience, observation, and the ability to manipulate our environments and selves to suit our needs. Luck, protection, happiness. Ladybug as a totem is one of personal expression, turning weaknesses into strengths, creating an image for ourselves and others which reflects the truth of our inner powers. Ladybug symbolism is an expression of love, pleasure and appreciation of the simple things in life, letting go of old hurts and pain. Ladybug medicine teaches us to follow our dreams through a combination of hard work, patience, and positive energy, fulfilling our wishes without sacrificing our experience or enjoyment of the present. Family, Play, Happiness. Lemur as a totem is very focused on family and friends, food, tradition, and enjoying the simpler things in life. Lemur people tend to be charismatic, unique, spirited individuals. They have a great sense of fun and are often considered eccentric, living in their own world (and happily so). Lemur medicine is rooted in communication, practical skill development, and matching energy level to situation so as to navigate smoothly and enjoyably through life. Leopard people tend to be independent, graceful and secretive. They are self-assured, aggressive, and are often known as intimidating. Leopard medicine helps people to learn to listen to their own intuition and instinct, and to understand that this sense is just as powerful as logic. Self-control, strength, nobility. Fairness, courage, patience. Lion people tend to be charismatic, prideful, protective, and peaceful unless challenged. They are very tactical, well aware of their own strengths and weaknesses, able to judge a situation and act to their best advantage through wit and skill. A lion totem can teach us to be a better leader and the importance of balancing work with family time and relaxation. Motivation, drive, strength. Lioness as a totem teaches us the power of the feminine, communication, relationships, and family. Lioness people tend to be responsible, ambitious, capable, and amazing caretakers and providers. Lioness medicine teaches us to be courageous, persistant, successful, intuitive, and present. Lioness is a master of balance between hard work and total relaxation, work and home life. Lioness can show us the importance of practice and persistence, giving us the energy and patience to pursue our goals. See also Lion. Endurance, service, sacrifice. Hard work, responsibility, stubbornness. Llama people tend to be sociable, giving, and easygoing, but fully capable of standing up for themselves if crossed. Llama medicine can teach us to relax and trust in our own abilities to maneuver even the most difficult paths in life. The secretive lynx represents controlled power, individualism, and sharp-sightedness. Lynx people are generally exceedingly observant, quiet, intelligent, and curious. Though their independent nature can strike some as aloof, they are often excellent guides and steadfast friends. Lynx medicine teaches one to develop their own unique strengths and trust in sense, instinct, and self. Calm, contentment, trust. Manatee as a totem is about taking life at a slower pace, stepping back and simplifying our lives, enjoying the little things. Manatee people tend to be gentle souls; playful, happy, loving, and generous of spirit. Manatee medicine can teach us to trust and open up, finding peace even when we have been hurt before. Elegant, gentle, innovative. The maned wolf, or kalak, is a spirit of independence – aloof and secretive, sometimes avoidant, but steadfast and loyal once trust has been gained. A maned wolf totem can teach us to follow our own path and not give in to the pressures to conform. Maned wolf people tend to be unique, individualistic, sensitive, shy, and are often misunderstood. Self-esteem, unpredictability, movement. Moose as a totem demands respect – it is a powerful, impatient energy that can be quite aggressive in its guidance. Moose people are often wise and experienced beyond their years. Moose medicine teaches us determination, confidence, ability, strength, and agility. Moose can help us find our personal paths and strengths, helping us to find greater purpose and place. Endurance, strength, survival. A musk ox totem can give us the inspiration to find life and hope in the hardest, darkest of times. To find an inner light and hold onto it despite anything that might be thrown at us. Musk ox medicine helps us to develop a strong defense against peer pressure, judgment, negativity, and adversity. Musk ox people tend to introspective, quiet, and observant but can also be playful and belligerent; they are easily overlooked or misjudged. Possum medicine is about health of mind and body despite external (or internal) pressures - keeping cool despite what life can throw at you. Confidence and flexibility, strategy, and comfort with one's true self. Possum as a totem can teach us that sometimes it is better to hide our strengths and not to fight, but to divert attention and stay out of the conflict. Possum people are often underestimated, but in truth are alive with hidden depths and talents. Ostrich is a symbol of pride, fertility, luck, and simplicity. Ostrich people tend to be truthful, happy, and sometimes avoidant. Ostrich medicine can teach us to enjoy the little things, and how to uncomplicate our lives. Wisdom through learning and experience gives us the vision to see and navigate anything we come upon, no matter how dark or foreboding. The ability to truly listen, and not be deceived by outward appearances; how to recognize the truth. Owl people tend to be secretive and complex, often preferring the solitude of their own thoughts to general interaction, though when they so choose, they make excellent teachers and spiritual guides. Tradition, vulnerability, specialization. Giant panda as a totem is about solitude and self-discovery. Giant panda people tend to be quiet, unassuming, focused, and unyielding. Giant panda medicine teaches us how to step back and disassociate from the more impatient aspects of life, being at peace with ourselves and letting go. Security, Trust, Patience. Red panda as a totem can teach us to be content, to tone down the pace of our lives and come to appreciate the fruits of patient persistence. Red panda people tend to be carefree, nonchalant, laid back, and playful. Red panda medicine can help to teach us the value of gentleness, caring, and compromise. Red panda people tend to be peacekeepers and expert negotiators. Playfulness, appropriate caution, joy in life. Parrot people tend to be thoughtful, intelligent, and often appear as shy, though are generally comfortable and vivacious around people they are close to. They are good communicators, often eccentric, vividly expressive and individual.Parrot as a totem can teach us to develop our intuitive judgment of people and situations, observing and taking time to develop and balance relationships; not letting our emotional responses and first impressions rule our relationships. Individual beauty, confidence, self-esteem. Peacock medicine can teach us to be bold, proud of our accomplishments, watchful, and observant. Peacock people tend to be successful, visionary, sensual, generous, and dignified. Peacock energy has an aspect of the phoenix to it, often a 'rising from the ashes' of great adversity to become a stronger and more vibrant, centered person. Peacock can teach us to balance pride with humor, being able to laugh at life and not take ourselves too seriously despite a tendency in that direction. Penguin people are often very organized, thriving on order and control. The penguin is a symbol of agility, drive, and purpose. Penguin medicine teaches the ability to move freely between realities and situations, and to replace chaos with order. Porcupine as a totem is about taking life at your own pace, being self-confident, not getting caught up in other peoples’ energies. Slowing things down, relaxing, concentrating on the simple things in life. Porcupine medicine can teach us to be less sensitive to criticism and outside influence and to let go of the past. Porcupine people are gentle and non-aggressive but with very powerful defenses against negative influences. Speed, effectiveness, quickness of the mind and body. Curiosity, creativity, intuition, balance. Pronghorn people tend to be adaptable, efficient, and skillful at what they do. A pronghorn totem can teach us to thrive in even the most difficult of situations and find multiple solutions to a problem by looking at it in new and innovative ways. Self-sacrifice, humility, family. Rabbit people tend to be soft-spoken and non self-assertive. The symbol of the rabbit is strongly tied to the cycle of life, fertility, death, and resurrection. The rabbit is also a symbol of luck, health, and clear-sightedness. Tenacity, authority, determination. Ram is an aggressive symbol, directly tied to creative impulse and action. Ram medicine teaches strength in the face of even the most severe of opposition, never giving up. Ram people tend to be strong-headed, masculine, prosperous, and assertive. Ambitious, sociable, adaptable. Rat people tend to be creative, intelligent, impulsive, and ostentatious. Rat medicine teaches interest, involvement, and the ability to live in the moment. Rat is both a symbol of luck and misfortune, of taking things as they come and the ability to deal with whatever comes your way. Protection, Self-assurance, Tenacity. Rhino people tend to be confident, solitary, and oftentimes difficult to read – which has lead to a stereotype of unpredictability. Generally withdrawn and introspective, they present a front of power, invulnerability, and ferocity when provoked. Rhino as a totem can help teach us to draw within ourselves, becoming less sensitive to external influences and more in tune with our own wisdom and intuition. Strength, determination, renewal Salmon people are often known for their dependability, wisdom, and strong sense of tradition. Salmon medicine teaches the value of being in tune with the cycles of the earth, skies, and our own bodies. Renewal, Acceptance, Perspective. Scarab as a totem can teach us to be practical, grounded, objective, and logical. Scarab medicine is about accepting things as they are and working with what you've got towards a goal, making your ambitions and dreams become realities through planning and effort. Scarab is about seeing the bigger picture and being able to break down complex tasks into more manageable pieces. Scarab people tend to be able to bring out the best in other people and are hard-working, persistent, frugal, and efficient. The scorpion is an emblem strength, destruction, and self-protection. Scorpion people tend to have an aggressive 'shell', often being known as aloof and intimidating; the impressive defenses protect a soft, emotional core. Scorpion people tend to wield a lot of power but are often reserved in its use, though they will not hesitate to retaliate if crossed. Sea Lion symbolism coming soon. Inner voice, inner rhythms, feeling, knowing. Seal totem helps us come to know the deepest parts of ourselves. Seal medicine is about embracing change, an ability to move fluidly within our lives, being flexible and powerful despite upheavals and changing situations. Seal symbolism is about movement, direction; even if you're not heading towards a specific goal, always going forward with all senses keen, primed, aware. Being able to handle anything that comes at you, confident in your personal abilities. See also Sea Lion. Perpetual motion, prowess, ability. Shark as a totem depends on movement and energy – navigation, water, primal instinct, and ancient roots. Shark medicine can teach us to go deep within ourselves and connect to our animal core; our ultimate motivations and true selves. Shark people tend to be powerful, introspective, motivated, high energy, and assertive. Caution, reputation, self-esteem. Skunk people tend to garner respect, having an extraordinary sense of self-assurance. Skunk is a symbol of truth, simplicity, and the ability to follow through. Skunk medicine teaches you to have pride in your own accomplishments and the importance of self-image. Snake medicine is strongly rooted in the cycle of life and death. Snakes are a powerful symbol of continuity and personal change. Snake medicine helps people to let go of things in their lives when they need to, and to be stronger for it, similar to a snake shedding its skin. Sensitivity, camouflage, agility. Snow leopard people tend to be introverted, quiet, observant, and independent. They tend to live partly in their own world, calmly perched above the small things that can easily consume day to day life. Snow leopard as a totem can teach us to overcome obstacles and navigate our lives with an agile, flexible step. Spider medicine teaches us that we are in control of our own lives, that we make our own destinies. What energy we put out is what we create. Spider can be a strong guide to show you the right path when the choices seem overwhelming or limitless. Spider people are often marvelous storytellers, keen listeners, and good at balancing all aspects of their lives. Grace, Dignity, Intuition. Swan as a totem teaches us to be calm, strong, meditative, and realistic. Swan medicine helps us be accepting of the things we cannot change, recognizing the good things we often ignore or take for granted, and to focus on the positive. Swan teaches us to trust that we will be supported and surrounded by what we need in life, buoyed by our outlook and attitude which in turn manifests and reinforces the cycle of faith and provision. Swan people tend to be faithful, serene, radiant, and fair-minded. Personal power, solitude, fortitude. The thylacine is a strong symbol of the unknown and the unknowable, making peace with the fact some questions in our lives may never be answered. Thylacine can teach us to step back from the public eye and live our lives along our own paths, protected from the pressures of outside influence. The Tasmanian tiger as a totem can help us learn to trust our own intuition, take pride in quiet accomplishments, and avoid the need for praise or dependence on external validation. Thylacine people tend to be secretive and aloof, introspective and self-confident, living mostly in their own worlds. Independence, strength, beauty. Tiger people tend to be confident, powerful people that need space, enjoy solitude, and revere silence. Tiger medicine teaches ferocity, passion, sensuality, and physical grounding. The tiger is a symbol of power, physical strength, and indulgence. Knowing how to retreat within yourself, to use your own strengths to shield and protect you from the outside world. Turtle medicine teaches us the importance of staying grounded, keeping our feet firmly in reality. Vulture medicine teaches us to trust in the universe to provide for us; that if we follow our true path we will be taken care of. Vulture people tend to be resourceful and fully developed in the skills that they possess. Mess seems to follow vulture, but in fact vulture follows mess. They are excellent at the ‘cleaning up’ of problem situations – whether they are emotional, physical, or spiritual. Whatever the mess, trust a vulture to have an efficient, effective solution to it. Stealth, energy, curiousity. Paying attention to your own intuition, being able to see the true intent behind words and actions. Weasel people tend to be self-assured, observant, and well grounded. Weasel medicine teaches us to be analytical, and to hone a keen, sharp mind. Similar to the ferret, with a slightly more serious edge. The werewolf is a shapeshifter – assuming the shape of a man, wolf, or a creature somewhere in between the two. Though often portrayed as a creature of horror, the werewolf is also a symbol of man’s connection to nature and his animal roots - the idea of being in touch with one’s baser nature. Whale medicine teaches us to open ourselves to the heartbeat of the universe. To take things in on a grand scale, and not sweat the little things. To remember the magic of life and of living. Whale medicine teaches us to listen to our inner voices, and to be in tune with the rhythms of our own bodies. Power, independence, strength of will and body. A wild boar totem can teach self confidence, self reliance, and avoidance of unnecessary conflict. Boar people tend to be aloof, stubborn and intimidating but are sensitive, intelligent, and loyal at their core. Boar medicine can teach us to be successful through hard work, vigilance, and fortitude. The African wild dog is also known as the painted dog, African hunting dog, Cape hunting dog, spotted wolf, or spotted dog. Its symbolism is of family, community, and a positive attitude. African wild dog as a totem teaches us success through perseverance, to be a good judge of character, and to be free with our affection but guarded with more intense love. Wild dog people tend to be friendly, social, compassionate, and determined. They are slow to offer trust but exceedingly protective and loyal to those they hold close. Cunning, passionate, opinionated. A wolverine totem helps us find dogged determination in pursuing life goals. Wolverine people tend to be resourceful, adaptive, and tenacious survivors. Wolverine medicine teaches us fierce independence and the ability to stand up for ourselves in even the most difficult and trying of circumstances. Stubborn, Confident, Capable. Zebra as a totem teaches us to look at opposing viewpoints to every situation, to try to look at things in novel ways. Zebra people can often seem obstinate and argumentative, but also have the ability to work through problems that would have stumped others. Zebra medicine helps us to think outside the box, stand out as strong individuals, and appreciate our personal uniqueness. If you have found this animal symbolism information useful and want to help me make more designs and descriptions of new species, please check out my patronage campaign. I will continue adding new species, so check back often! I have offered this listing of animal totems to help you along your journey and as a collection of my ideas and research - please do not copy (online of off) or take pieces from this encyclopedia to use elsewhere. Please feel free to link to my page here if you would like to share! Thank you!